Sequels don’t often live upto expectation or the class of the original. Sure, there are some that exceed it, such as Street Fighter II and Creatures II, but often the sequel of a game is more likely to be a welcome return, an enchancement that doesn’t do that well as the gameplay mechanics are screwed, or just something dreadful. It does seem to be the case though if you call something other than “Game Name 2”, it will do better – take for example the two games mentioned in the second sentance. 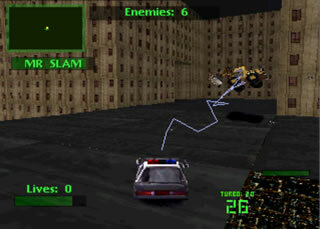 Twisted Metal: World Tour was the second game in the Twisted Metal series that is still going strong today. The first game was a fairly average but nice concept car battle game, that used weapons and cars to blast opponents into submission. Whilst fun, the characters were a bit samey at times with a number of overly flashy cars, and the levels were even worse – using fairly nondescript areas of Los Angeles. Twisted Metal: World Tour changed that from the first game. First, the character lineup was vastly improved to include a more varied range of characters. Included were an F1 Car, a Hearse, a JCB and a guy with two hands trapped inside giant wheels. My favourite car from the original – a taxi – was dropped, but everything else was there. Paris was probably the best level in the game. LA was the sole area in the original, at it was destroyed beyond recognition in the first Twisted Metal (which is the name of the tournament that the game takes it’s name from). Calypso (the tournament owner) decided to hold his latest tournament worldwide. This was a masterstroke as it gave a rise of the memorable levels of this game. Why memorable? Because there is one which is a bit poor, the rest are awesome. 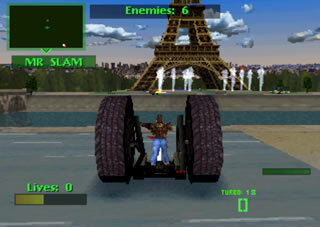 Paris is probably the best level in Twisted Metal history (and – if you’ve ever been – it’s surprisingly accurate for a game of this nature), and even levels such as the Antartic are tremendous fun. I do also have a soft spot for the level that’s set in Holland, as the 9 car clusterfumble that it is makes it tremendous on multiplayer. The other beauty of this game is the indepth storyline. Twisted Metal is from the Mortal Kombat school of “games that shouldn’t have storylines but do”, and Twisted Metal: World Tour probably has one of the better ones. For one, it continues nicely from the first game. Secondly, it continues the story and everything makes sense in the beginning. Finally it’s the last Twisted Metal game I liked. The third and fourth installments of the game were rubbish, and the “True sequels” on the PS2 the game took a lot darker role, which I don’t like. This game still maintained a black humour which made it less scary and (no pun intended) twisted than the later games. It was colourful, and – whilst violent – wasn’t as sadistic and evil as the later games. This game is a pretty much retro game classic, like – with a lot of games on this site – didn’t really get the attention it deserved, particuarly in the UK markets. In the States it was more successful, but the amount of times this game has been re-reviewed and pepole have said “you know what? It’s actually rather fun”. It’s not particualrly deep, and the car controls are a bit idiosynchratic. Nevertheless, this is a fabulously fun game, and the price of it on ebay shows that those who have played it, love it. Twisted Metal 2 = best 2-player game ever. Nice article!